I’m just old enough that I can remember as a kid going to one or two gas stations that still had an attendant who would fill your tank as you sat in the car. Our family would pull up to the pump, my Dad would roll down his window (not with the press of a button) and tell the attendant what type of gas he wanted. As the tank filled, the attendant would clean the windshield. 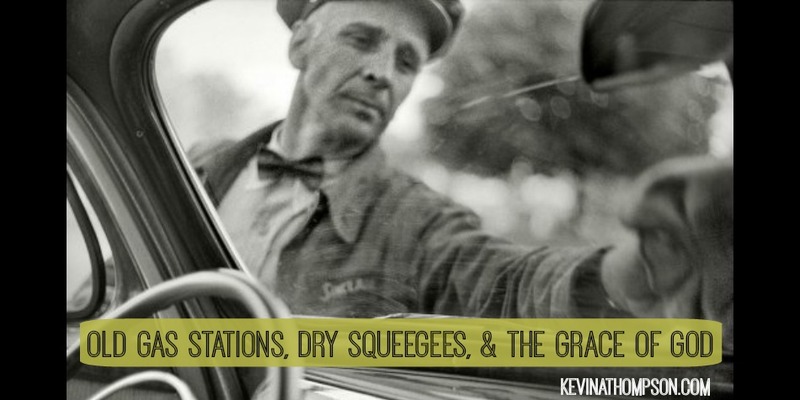 Sometimes the pastorate feels much like that sponge and squeegee. We often deal with the dead bugs smashed on the windshield of life. Many times the people we deal with are unable to see clearly because of the dirtiness they have endured. As a pastor, I’m called to help them apply God’s cleansing grace to their lives. Yet if I’m not careful, I can fool myself into thinking all they need is a squeegee. They need me to clean the bugs off. So I scrape and I scrape, but with very little success. When you squeegee a dry windshield, all that happens is you end up smearing the bugs even more. It’s easier to see out of a dirty windshield than it is to see out of a dirty windshield which has had a dry squeegee dragged over it. You see, it’s not really the squeegee that cleans the windshield; it is the water. The squeegee might help to make the windshield clean, but the water is what really does the work. So it is with God and his grace. Church, preaching, and other aspects of faith help, but they only help if grace is doing its work. Yet when I am dripping wet with the grace of God, I can be used in mighty ways to assist people in experiencing that same grace. Tonight I am reminded that I don’t need to scrub harder, I need to soak more. People don’t need more of me, they need more of Jesus. I am only of use if I am soaked in his grace.